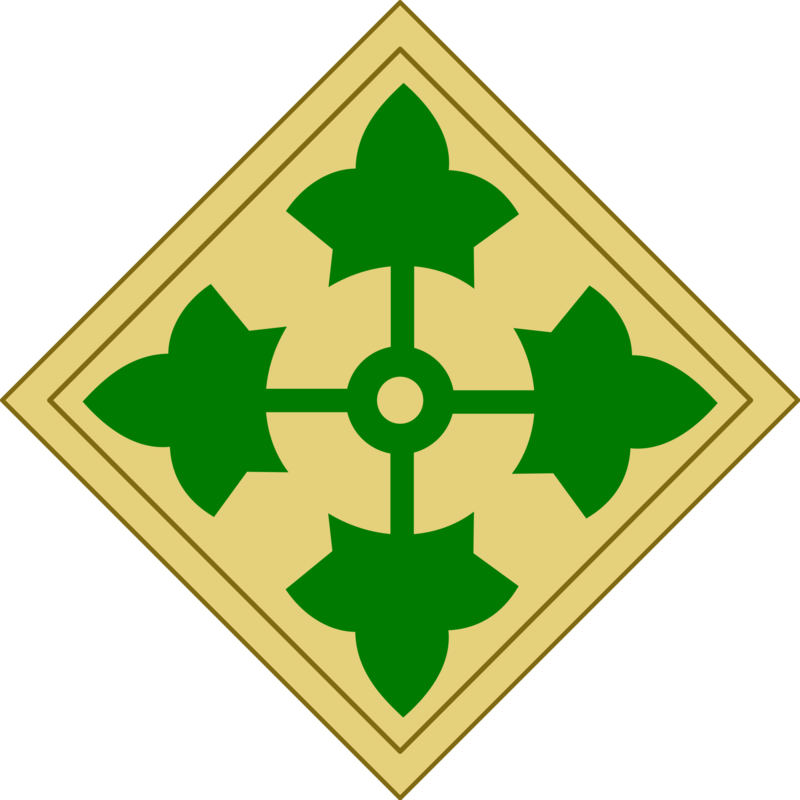 The 4th Infantry Division first saw combat during World War I. During the St. Mihiel Offensive, the division took over a stretch of line previously occupied by the French, and then was able to launch an attack and quickly knock out the salient around St. Mihiel. The divison next fought in the Meuse-Argonne Offensive. It was able to press forward and push back the Germans despite supply issues, heavy machine gun fire, and frequent gas attacks. The division next fought during World War II. During Operation Overlord, the 4th Infantry Division landed on Utah Beach and claimed that it was the first unit in the amphibious assault to land in France. The division then continued across France and helped capture Cherbourg. It then traveled through Belgium and attacked the Siegfried Line, and although the men from the division breached the line, they were stopped in the Battle of Hurtgen Forest. From there, they moved to Luxembourg, where they stopped a strong German assault during the Battle of the Bulge. The division then counterattacked, but was stopped at the Prum River. They later managed to cross the Rhine and attack across Bavaria, capturing swathes of German territory. During the early Cold War, the division was attached to NATO to deter the Soviets. From 1966-70 the division served in Vietnam, where it participated in Operation Attleboro, the incursions into Cambodia, and Operation Junction City. All of those operations dealt significant damage to communist forces. During Operation Iraqi Freedom, the division helped push through Mosul and Tikrit, and was part of the operation that captured Saddam Hussein. After defeating the Iraqi government, the division helped combat terrorism in the very hostile area around Tikrit, Saddam Hussein's hometown. The division later deployed to Afghanistan where it fought the Taliban in Kandahar, its birthplace. It fought in numerous highly challenging battles, such as the Battle of Kamdesh, where a small outpost was attacked by over 300 Taliban insurgents. Most recently, the unit has deployed to Iraq in order to fight ISIS.